A rich, moist, basic cake that can be varied by using different flavorings, frostings, and toppings. It is sugar-free, grain-free, gluten-free, and delicious. Preheat oven to 350º F. Grease a 9-inch round cake pan, line with a circle of parchment paper, and grease the paper also. Dust with coconut flour and tap out the excess. Put almond flour, coconut flour, erythritol and/or any other dry sweetener, baking powder, and salt in food processor. Process for about 2 minutes until well mixed and erythritol, if using, is very finely ground. Alternately, grind erythritol in a spice or coffee grinder and whisk with flours, baking powder, and salt. Reserve. Beat the butter and cream cheese with an electric mixer until fluffy. Add one egg and beat until incorporated. Blend in extracts and any liquid sweetener. Sprinkle xanthan or guar gum over butter mixture, a little at a time, and beat in. Add remaining eggs, one at a time, alternating with reserved flour mixture, and beating until smooth after each addition. Beat for an additional minute. Scrape batter into prepared cake pan and level the top. Bake at 350º F for 45 to 55 minutes or until golden brown and a wooden pick inserted near the center tests clean. Set cake on a rack to cool for 10 minutes. Run a knife around the edge to loosen. Turn cake out of pan and place, right-side-up, onto a cake rack. Leave until completely cool. 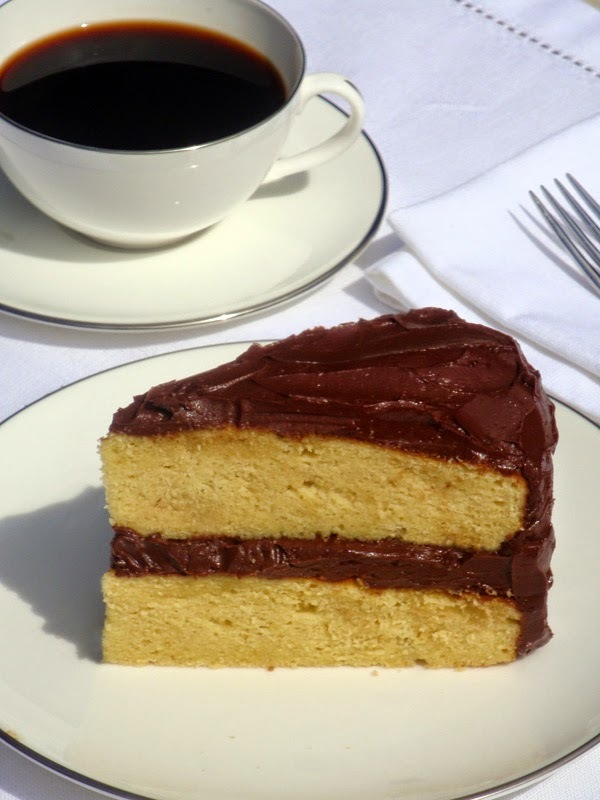 Frost with Chocolate Butter Cream, recipe below, or serve with sugar-free whipped cream or sugar-free ice cream. * Bulk sweeteners include xylitiol, Swerve, Sweet Perfection, LC-Sweet, Just Like Sugar, Truvia, and Natural Mate (use 1/2 the amount for the last one). **EZ-Sweetz liquid sweetener comes in stevia, sucralose, or monk fruit versions. All have zero carbs. Insulating wraps are available for cake pans so the layers will be level rather than uneven on top. Look for ones that fasten with velcro strips. No need to feel guilty when you indulge in this rich, chocolaty frosting. Double the recipe to fill and frost two layers. If using granular erythritol, whirl it in a coffee or spice grinder or a food processor for a minute or two, until fine—let it settle before opening the top. Beat the butter in a medium bowl with an electric mixer or by hand until fluffy. Beat sweeteners into butter, then beat until smooth. Blend in the cocoa powder (slowly or it will escape). Beat in the vanilla, salt, and the cream or coconut milk and the egg yolk, if using. Add additional high-intensity sweetener to taste, starting with a small amount. Store frosting in the refrigerator, but let it warm up a bit before serving. Makes frosting for 9-inch cake (10 servings) or about ¾ cup total. Recipes adapted from Nourished; a Cookbook for Health, Weight Loss, and Metabolic Balance. Butter Cream, Chocolate, Yellow Cake. Bookmark. This looks incredible! Can't wait to try it! "Make Sweet Treats Without the Sugar"